Maid in Hoboken is one of the largest cleaning services in Hudson County, and our commercial cleaning services for area businesses offer exceptional quality and cost effectiveness. Our reputation for having the most qualified technicians and flexible cleaning schedules has earned us over 2,000 valuable customers who trust in our experienced professionals to deliver daily detailed cleaning, specialized medical or construction clean up, or weekend services such as dusting, mopping, and vacuuming. Whether you are a large firm or a small business, you deserve access to the best commercial cleaning services at the most competitive rates. With our dedication to continuous improvement, Maid in Hoboken believes an exceptional cleaning service shows an upward trend in quality and customer satisfaction. For each of our commercial clients, we design a customized cleaning program after analyzing the facility, location, surfaces, specifications, and budget requirements. Intended results are discussed so that we can execute the best cleaning plan and dedicate the proper staff, equipment, and supplies. A dedicated manager answers every call or concern to ensure ongoing, high quality service. Maid in Hoboken is fully bonded and insured, and we use Green Seal certified products to protect the environment, your employees and your visitors. Our commitment to good hiring practices, effective training, and sufficient supervision are aimed at maintaining happier, more productive and confident staff who take pride in their work. We have longstanding relationships throughout Hudson County where we serve Bayonne, East Newark, Edgewater, Guttenberg, Harrison, Hoboken, Jersey City, Kearny, North Bergen, Secaucus, Union City, Weehawken, and West New York. 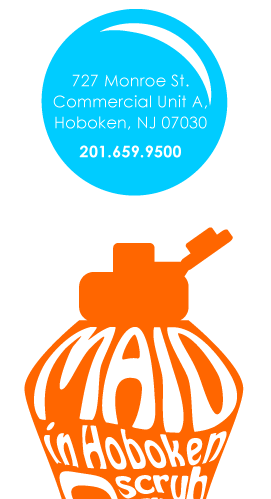 Clients of Maid in Hoboken value the friendly service, consistent quality, and effective, efficient cleaning techniques that keep their premises looking spotless and professional. Call us today at (201) 659-9500 or complete our estimate form and let us give you a cleaner commercial space.